Keeping customers happy is vital for family fun centers, museums, amusement parks, and just about any attraction where people gather for pleasure. But what are some of the best customer service tips – and employee training tips – to make sure customers are satisfied and ready to visit again? At The Hub Family Entertainment Center in Missoula, Mont., general Manager Chris Whilborg said that to create the best customer service experience, he makes sure all of his employees are trained well and cross-trained in every department. “We also make sure we’re scheduled correctly in terms of staffing, make sure everything is clean, and make sure that when people walk out they have a smile on their faces. Customer service comes first – after all, customers are the ones that pay the bills,” he says. 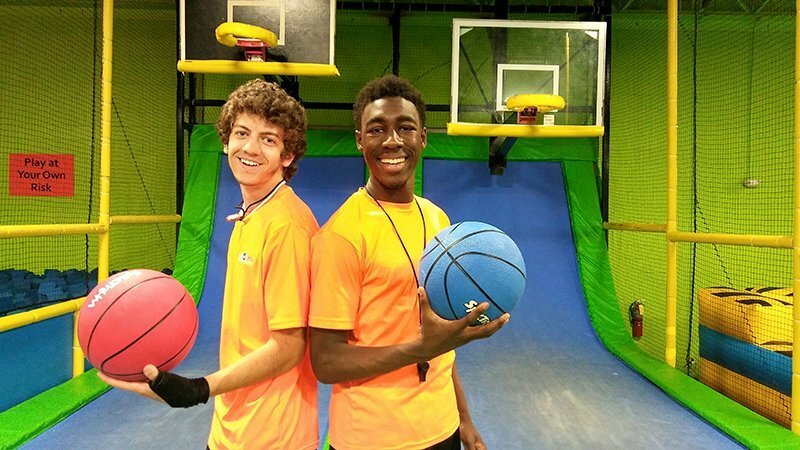 Michael Head left, with Joshua Wright, employees at Kennesaw, Ga.’s Jumping World. Trampoline parks are a growing attraction type in the industry. 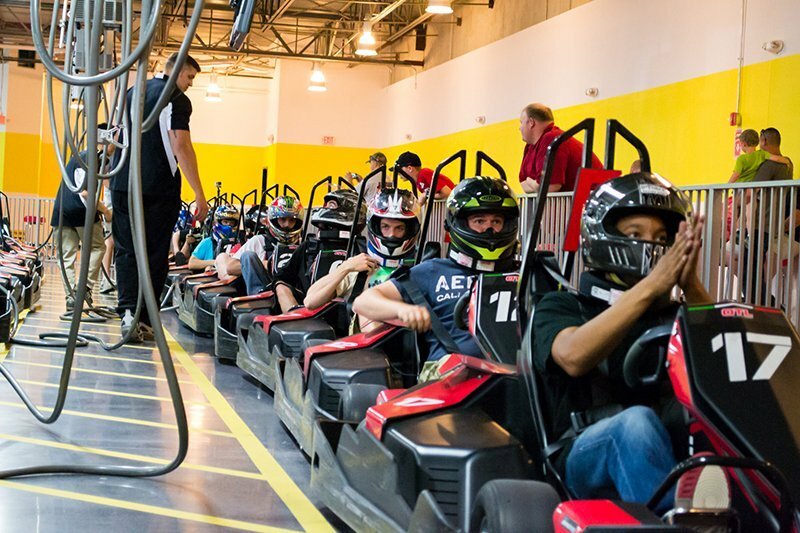 Go-karts lined up at Thunderbolt Karting in Richmond, Va. A story in the June issue of Tourist Attraction & Parks (TAP) magazine quotes an official with the center. Along with team meetings and role play, Zuckerman’s staff also watches other team members and management during busy weekend times. “We want them to see firsthand how a lead or supervisor or manager would handle a situation, and what is the best way to handle things confidently,” Zuckerman related. “Building employees’ confidence and letting them know they can trust us, that makes staff members more prepared, it makes them better able to approach people and give them a great experience.” He finds this especially important as his staff is fairly young, primarily between 17 and 22 years of age. Duplan advised providing a general overview to the staff about exhibits, and allowing staff members to experience the exhibits themselves to train them. At the museum, being empathetic with guests means being accessible and friendly, and providing information. “We make sure our employees know how to enhance the experience of visiting our museum for guests. We have people who come to visit from all over the world. We feel like we are ambassadors not only for Houston and Texas, but for the U.S., for the whole world. We are here to promote art and art cars and our city. We are good will ambassadors, that’s how we look at it.” Duplan believes the most important aspect of customer service overall is friendliness. “Make guests feel welcome. Although we don’t do tours, we’ll go into the exhibits and comment on whatever the guest is looking at. It makes them feel like they are special. We’re all special, really,” she laughed. As Duplan said, everyone is special. And perhaps the ultimate key to great customer service is to make sure every guest feels that way. Bumper cars at Pin Strikes, Stockbridge, Ga. The June issue of TAP contains a story about the benefits of adding bumper cars and other attractions to increase guest satisfaction. QubicaAMF Worldwide (QubicAMF), a leader in offering bowling and mini bowling products, has announced that is it entering into a distributor agreement with American Bowling Service, Inc. (ABS) in Japan. Effective April 1, ABS will serve as QubicaAMF’s exclusive, full line distribution partner in Japan for capital equipment, automatic scoring, parts, supplies and pins. ABS is large distributor and manufacturer of bowling supplies in the Far East, celebrating its 50th Anniversary in 2014. The company was established as a distributor of bowling balls in Japan and currently has headquarters in Ota-ku, Tokyo. In 2003, the ABS Logistics R&D Center was established in Ichikawa-City, Chiba. ABS sponsored the 37th ABS Japan Open Bowling Tournament in Inazawa, Aichi in 2013, which was the 10th Consecutive Crown Sponsorship. Additional information about QubicaAMF is available at www.qubicaamf.com.